Rural housing isn't a new area of concern. Although certainly related to poverty sometimes, potentially also this issue simply reflects an inadequate supply in the face of new demand, an excessive supply of housing leading to maintenance decline, or a sudden loss of homes due to a major storm. Since this website leans toward community-scale issues and solutions, let's talk about how your community should determine the extent of its rural housing need. I grew up in a rural area, and we did not think much about housing problems. We just thought that the people who lived in run-down houses either could not earn much money because they were bad farmers or did not have enough land, squandered their money on liquor or creature comforts, or just were slobs who did not maintain their abodes. But now I have worked all over the U.S., and I have read the research and observed enough to know numerous factors leading to rural housing quality and quantity issues. If you are working at the policy level in a rural county, the quantity and quality of housing you have available could present a challenge. If you have or reasonably hope to have industries where people from outside the community would move into your area, you need some housing choices. And you need homes with current amenities and in move-in condition. Current amenities means good water quality and pressure, indoor plumbing, an urban-type sewer system or a relatively new and easy to understand septic system, a kitchen that's been remodeled since the 1980s, adequate storage space (preferably in the home, not in an outbuilding), a good quality heating and cooling system, a broadband Internet connection, reasonably priced multi-channel television system, and a paved or otherwise very all-weather road. If the economic development you reasonably hope to attract would bring a mix of income levels, you also need some executive housing. If it is not already constructed, at least you need the bones of such a subdivision, with one or two examples constructed. People are willing to commute about half an hour, and beyond that it tends to become a drag. So longer drives won't bring a very stable workforce, although of course there are exceptional individuals who will drive an hour or two each way for years. If your rural community needs help in planning for its identified housing needs, consult with Council for Affordable and Rural Housing, which contains the builders, bankers, accountants, and other professionals involved in rural housing. 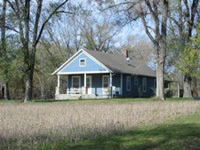 The USDA offers a Housing Preservation Grant. Grants may be used for low-income rural homeowner repairs and rehabs, and rental property owners also may use funds to repair rural housing if they make it available to what the government calls low- and very low-income persons. Check to see if another round of funding is scheduled. The quality of migrant farmworker housing is consistently an important concern. In many areas where Native Americans opt for more mainstream building methods, they are learning some of the downside of those building methods. And then the areas of concentrated rural poverty, such as Appalachia, the Mississippi Delta, and the colonias in the American Southwest, tend to exhibit severe shortages of livable housing. Certainly the need for new solutions to the rural housing problem is a dominant issue in the rest of the world too. Worldwide communications raise the expectation of rural folk, and not it's time for creative solutions. Often a rural housing problem is only a sub-set of an affordable housing problem in a region too, so read up on that topic. If you see affordable rural housing as your main problem, you'll need to become well-versed on rural economic development opportunities. There are good ideas for increasing the rural housing supply in an affordable way. This is my least favorite way to add to the supply. They are built with planned obsolescence, and good maintenance doesn't extend their life very long. They aren't very storm-worthy, and when they catch on fire, results are very fast and often tragic. If left with a metal finish, that begins to dull almost immediately. Those that look like wood can stay looking presentable longer, but my advice is that mobile homes are a temporary solution. Having said that, if you need a large supply of rural housing quickly because you struck gold on the economic development front, of course feel free to quickly install a large mobile home park. If you need to add many mobile homes, I'd prefer to see you create one large park rather than string them all over the countryside. You can assemble the land as quickly as you can find a seller, and utility installation becomes so much more economical. If what was thought to be temporary becomes a permanent solution, at least you are in a position to screen the entire park with a handsome row of trees and to deal with one owner to make sure that substandard units are replaced or booted out of the park. You can incorporate some green space into a large mobile home park, and perhaps you can have a small gas station and convenience store at the edge to provide for some basic needs. If you're going to update an old farm house, do it right. Making it reasonably energy-efficient may be the first and most important task. Speaking directly from family experience here, you can install new finishes every place in the house, and it still won't be a desirable residence if the heating and cooling costs are outrageous. The good news is that solar panels have decreased in cost rather dramatically over the past decade, and solar is very practical in many rural areas where there are few other buildings around to block access to the sun. Without a sound energy plan, you will have a hard time renting the house on a consistent basis, and a tough time selling it to recover your remodeling costs. So quality energy-efficient windows and insulation as appropriate in your region are critically important. On the plus side of renovating an old house, you can install all new plumbing and electrical systems, roofing, drywall, siding if necessary, and flooring, and have basically a new house. Many were built very sturdily, so a careful remodel results in a better product than most new homes in town. And most old farm houses had large "country kitchens," so that currently coveted amenity is already in place, at least in terms of the size. If you live in an area where the typical rural house is white with a gray or black roof, you can add the curb appeal we now crave through adding color with shutters, landscaping, or even pavers as sidewalks. Reduce cooling costs by adding white roofs. If the old houses need room additions, you probably will want to add a bedroom or two with very large closet spaces. If the houses have no attics or basements, storage is going to be a problem. One solution is to build a large attached (or detached but nearby) garage that would offer some unheated, uncooled storage space. Labor in rural areas is inexpensive, but highly skilled labor may be scarce. So keep it simple, and infuse elegance into your project through great siting, large expanses of open spaces if you make an addition, and color and good functional landscaping outdoors. Functional landscaping can certainly include native plantings and vegetable gardens, with turf grass requiring mowing kept to a minimum near the exterior doors. If you grew up on a farm, probably the idea of living in an old chicken house doesn't sound appealing at all. But remember, you're simply looking for viable buildings, and I think you should look with fresh eyes at all available buildings. Barns could be turned into a two-story two-family or four-family residence for young families, with a huge towering central hallway or great room that would be shared. You can keep a barn door for a less-frequently used entrance and for character. You have high ceilings, great old wood. What you probably don't have is energy efficiency, so you would need to judiciously add insulation without covering up all of the old wood and destroying the character. Some of the large metal or wood storage buildings and shops that are found on farms also have potential to be turned into housing. Some were insulated and most were electrified, and adding windows and doors is almost always possible in such a situation. Plumbing would be your biggest nightmare. Fourth, very small towns often offer an abundance of old commercial buildings and places of worship that could be repurposed as housing. Old commercial buildings may offer the advantage of a nice bright front window. They will tend to have an open floor plan area that can serve as the main public space, and there will be at least some partitioned off private space. The lack of hallways and a flow may be a problem, particularly in those commercial buildings that are essentially long rectangles with the narrow end at the street. Old churches sometimes have kitchens and plumbing already installed, and unless they have been abandoned for an extremely long period of time, they already will have an electrical service that can be upgraded. If you find stained glass windows, how lucky is that? Many older churches also had beautiful hardwood floors. And certainly you have the currently desirable high ceilings and an open floor plan, usually with some little private rooms off the main room. These can be kids' bedrooms, and you can install mezzanine-type bedrooms as well. In smaller towns churches had lawns, maybe some off-street parking already, and sometimes some nice trees or landscaping. If you have to start from scratch with a kitchen in an old church, try using the stage, which most of them have. Today a kitchen is partly about showing off anyway. By the way, I'd suggest that converting old churches and stores in small towns into housing is your high-end rural housing, not the affordable housing. The unique problems of rehabbing these old large spaces will take money, but the results will be worth it if the money is combined with good taste and inventiveness. 1. Learn about cluster development. Find an investor/developer to buy one farm and then minimize road-building and utility extension costs through clustering the houses relatively close together. Make it something of a rural cul de sac, where four driveways stem from a single small semi-circular pull-off from the main road. Yes, you would need to have a homeowners association of sorts to manage the remainder of the land, but do not let that bit of legal work stop you from the most desirable rural housing solution if you need to add to the supply. 2. Build multi-family rural housing structures wherever the market allows. Build in extra sound insulation and make them as large as practical, so that the tenants will be long-term tenants. Or that you can have a rural housing condo. Rural and small-town people might especially appreciate the four-unit building where each family has a front door facing one direction. Kitchens and baths can be clustered toward the middle of the unit for greater efficiency. 3. Build rural housing for the climate. If winter winds are cold indeed where you're building, consider the old idea of the windbreak, where a nearly solid row of trees breaks the force of the prevailing cold winds. If your summers are severe, build for cross-ventilation but also use thick walls, great insulation, and plenty of ceiling fans. 4. Minimize the area of walls and roofs you build. This conserves energy, cutting costs and maximizing future flexibility. As a sidebar, in the sub-tropical and tropical climates, consider using outdoor passageways as halls. If there's a need for a private master suite, maybe part of the privacy is that you go outdoors to a separate building. But of course, this has to be weighed carefully, as then you are building more exterior walls. 5. Use local materials and native plantings. If you're going to have stone for a fireplace, by all means try to find something local. It not only brings local character indoors, but it also minimizes transportation costs. Look around for what is abundant, and try to figure out how to use it as a building material. Maybe there's something local that can be recycled into a mantle or a kitchen counter. If you have lots of barrels, pallets, or hay bales, shouldn't that be a suggestion? If there are many buildings falling down in the area, can't you salvage some good wood? 6. By all means, look into prefabricated and prebuilt housing of various types. Since skilled labor often is a problem in rural areas, because the really skilled are in such high demand they're difficult to schedule, maybe some element of the home or all of it can be shipped in. But it's not as inexpensive as you think. Shipping containers as housing is a mini-trend right now, so if you live in a rural area where there might be abandoned railroad cars and such, check it out. If you're near an urban area, they are nearly free there. 7. Earth-sheltered homes are very practical in hilly parts of the country. In this building type, one side of the home is built into the hillside, which provides great natural insulation and sometimes a reasonable building cost. The other side then needs to provide the doors and windows. Try not to solve a rural housing problem by imitating larger towns and cities and creating the next slum through use of poor quality building materials. Instead, increase overall affordability through providing cost-of-living reductions. Rural areas offer abundant opportunities for energy conservation, water conservation, and local food production. Rural areas are ideally suited for windmills, rain barrels, cisterns, vegetable gardens, and growing chickens for food and goats for milk and cheese. And rural housing proponents may find locally plentiful odd materials that might be used as insulation. In short, the rural environment is great for sustainability. Get inventive. You can do this. So far we've been Pollyanna, and acted as if your main issue is how to add to your housing supply. But many of you have old houses falling down all over the place. And sometimes houses that are perfectly all right, at least with a little paint, but you have little or no market demand for them. You need to separate those two classes: those probably not worth saving, and those that could easily be brought back to life if there were a demand. Just as we advise in towns, when something becomes an eyesore and there's no demand for it reasonably in sight, tear it down. "Deconstruct" it so that the building materials are salvaged. See if you can find a buyer now, but if you have a deconstruction program for several old houses and their outbuildings, you'll have a better chance to attract a good bid. If you don't receive one, see if you as the county or village can afford to store these old building materials. They have worth to someone somewhere. When a housing unit is easily salvageable, but your demand is so low that it's just sitting around going downhill, you need to consider a land banking program. If your county or other local government can afford it, think about buying some of these better buildings and systematically maintaining them. If people in your community simply have better housing choices that they can afford, maybe some of these buildings should be upgraded in order to be rented or sold. Maybe they can be used for a community function, although the utilities cost tends to make that prohibitive. Perhaps in this electronic age, you can find a non-profit in a nearby city that will manage them for people who need low-cost housing. All of these programs have their difficulties, we realize, but try to preserve some options by keeping the best of your vacant housing viable. Disassemble the least viable houses and keep the building materials in your community or earn income from them. In Florida, California, Texas, Oregon, and other states and parts of the world, large numbers of seasonal workers arrive to work a few months of the year. Since they are low-paid labor to begin with, they aren't going to afford permanent housing. In Florida I saw 20, 30, or 40 men jammed up into relatively small buildings, way out in the middle of the groves. The owners were hoping to escape the notice of my code enforcement guys, but it didn't work. We had a helicopter. Anyway, living conditions were relatively poor. The ability to maintain a hygienic level of cleanliness becomes a problem when that many people were in such close proximity. And the plumbing situation definitely mattered. The growers who bring in these workers need to solve this rural housing problem, in partnership with their local governments. Potentially the local government can help subsidize the farmworker housing by renting some of the space for homeless folks the rest of the year. The local government also could facilitate partnerships with universities and businesses who might have a need for lower-cost temporary housing at a different season than the planting or picking season. But I'm not suggesting that the local government subsidize the farmworker housing at all. The major problems to be dealt with are the inadequacy of the sanitary and electrical systems. Lack of privacy and graceful amenity can be dealt with through easier access to the community as a whole. Maybe if the growers stop hiding their (illegal?) workers, they could get out and about. The lack of space doesn't bother me too much, because I don't think it bothers the workers too much. But the health issues are another matter. Another solution that has always intrigued me is the possibility of combining farmworker housing with religious retreat facilities. Let's see, where else in society do we consider bare-bones accommodations a bonus? Oh, in a religious retreat setting. So maybe if we introduce some folks to each other, we could figure out how to provide decent but very modest, two-persons-to-a-room buildings that would be partially subsidized to the farmers by retreatants under the sponsorship of a religious organization for the rest of the year. As a rural housing buyer or provider, you have the usual array of financing opportunities. In fact, the first step should be to stop in and chat with your local banker, who'll know what's hot and what's not in your area. However, a couple of families of specialized financing sources for rural housing are the USDA's Rural Housing Service and the private AgFirst Farm Credit Bank. The Housing Assistance Council is a private non-profit that allows low-income rural families to provide "sweat equity" by working on their homes. They are especially strong in the poorest of America's rural neighborhoods.